You will get 20000 REAL Human MOBILE web traffic (most from Android & iOS platforms), from main social media websites, and organic web traffic from most important search engines. - Worldwide traffic, including from USA, Canada, Europe etc..
- CPA, affiliations, landing pages, blogs, etc are welcome! Almost any type of links are allowed, but except illegal, some shortened, redirrected, download, malware urls, streaming urls are not allowed (audio or video)! - You will get traffic from Android and iOS platforms, not only from iOS or only from Android. - I can't guarantee any sales, conversions, signups, etc. 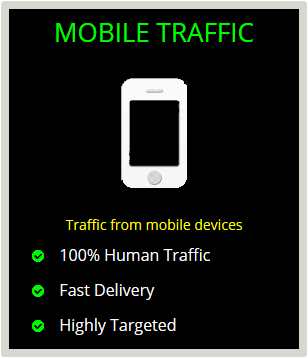 Get 20000 REAL Human MOBILE Web Traffic To Your Blog is ranked 5 out of 5. Based on 2 user reviews.